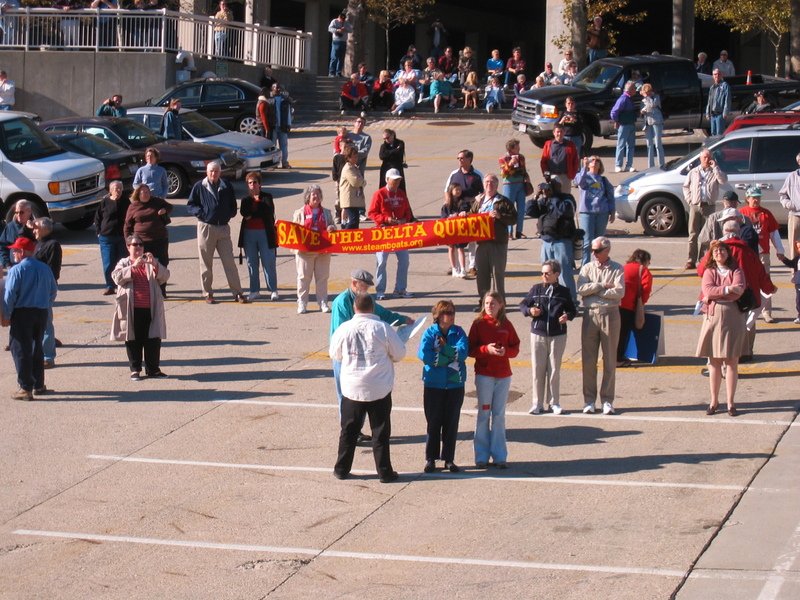 Well, today the Delta Queen departed on her final cruise. The boat will run from Cincinnati down to Memphis ending on October 31. We enjoyed a wonderful Tribute Event for Cincinnati before we departed with a parade of VIPs and almost 400 supporters and fans along the landing. 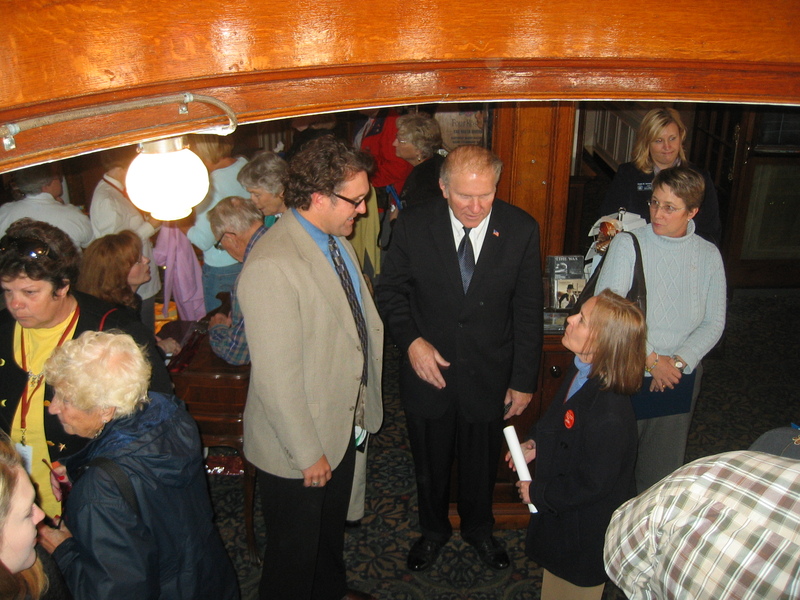 Bill Wiemuth, Congressman Steve Chabot, and Vicki Webster visit at the base of the Grand Staircase. Congressman Steve Chabot attended and gave very encouraging remarks about the possibility of still securing the exemption extension necessary to allow the Delta Queen’s continued operation. We are so thankful for his introduction of H.R. 3852 almost a year ago. He has fought tirelessly in support of the Delta Queen, despite the continued blockage by Transportation Committee Chairman James Oberstar. Also attending was Cincinnati resident Vicki Webster who has tirelessly served as the point person for the grassroots Save The Delta Queen campaign efforts to secure the exemption renewal. A Senate Bill (3498) also was introduced over a month ago by Ohio Senator George Voinovich. We were honored to have a proclamation presented by Nan Cayhall from his office. Senator Sherrod Brown co-sponsored of the bill and another proclamation was kindly delivered by his representative Kristin Marie Vennekotter. 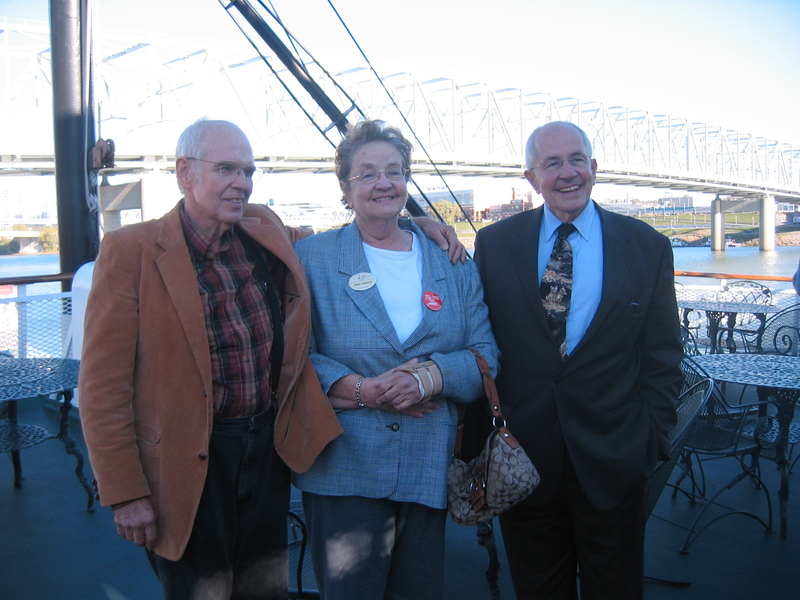 Tom Greene Jr., Jane Greene, and Gordon Greene Jr.
At the end of Word War II, Captain Tom Greene of Cincinnati’s Greene Line of Steamers purchased the Delta Queen at auction and had it towed more than 5,000 miles from California to the Mississippi River. He invested another $750,000 to prepare the Delta Queen for another life on the Ohio and Mississippi River system. After Captain Tom passed away in 1950, his widow Letha Greene managed the company and the Delta Queen for the next 19 years. We were honored to have with us today three of Letha and Captain Tom’s children with us today. Tom Jr., Jane, and Gordon Jr. spent much of their youth onboard the Delta Queen. It was very special to have them with us. They still keep the faith that the boat may return again. Captain Gabe Chengery was Master of the Delta Queen for most of 30 years. Now retired, he is traveling aboard this historic cruise as a passenger. But we were able to convince him to share his keyboard talents with us and honored to have him play the final departure calliope concert as the boat turned downstream. He kept the music going under the Roebling Bridge and on downstream until the Public Landing faded behind the bend in the river. The sun shone brightly in many moist eyes as the Delta Queen rounded the bend into the pages of history. Farewell fair Cincinnati until we meet again.